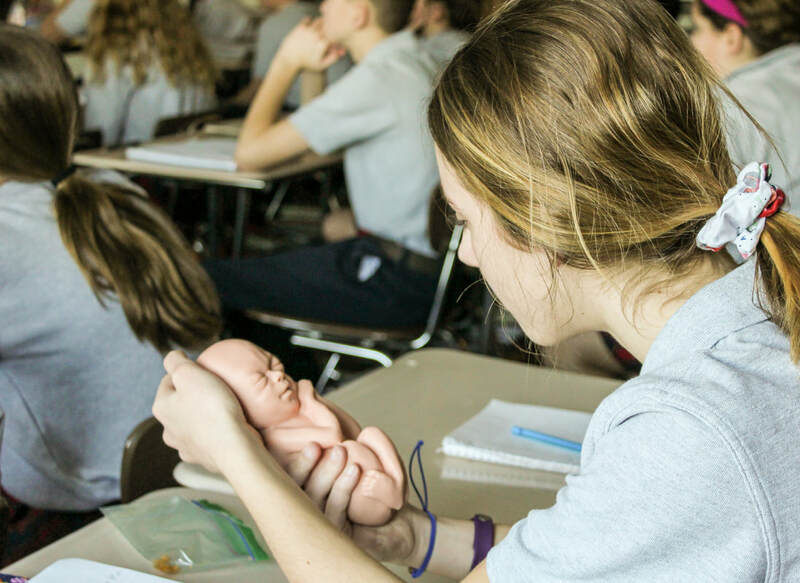 Our middle school presentation - called The Heart of the Child Presentation- gently addresses the topic of abortion and reveals to students who they are as children of God - spiritually, emotionally and physically. Students hear the story about how a seven-year-old was inspired in prayer to start the Pro-life Prayer Pillows. They uncover Scripture about the unborn and their beautiful identity as children of God, see a live ultrasound and view slides on the amazing development of the unborn child. Children also have an opportunity to get involved with fundraising through the Pro-life Prayer Pillow ministry or have their own diaper drive or baby shower to help moms in need. or contact Nikki Schaefer for more information at 402 968-5308 or nikki@heartofachildministries.org. "This is a BEAUTIFUL ministry and it was such a blessing for me to be apart of this presentation! My own kiddos were SO IMPRESSED and I know the overall message stirred their hearts! I have heard this from other parents too. Thank YOU for doing this." ​"Seeing the live ultrasound made me want to cry. It is so undoubtedly amazing how something only 17 weeks old is circulating its own blood, has working organs, and continuously moves around. Hearing the baby’s heartbeat is the most amazing thing. It shows that it is more than just a lump of tissues and cells. It is a baby and it is fully alive. " "I really liked that the prayer pillows were started by a child because it shows that abortion is something even a child knows is wrong and that we can all help save lives in small ways." ​This was a wonderful pro-life ministry to all our students, grades K-12. The presenters were professional, knowledgeable, student-friendly and beautifully pro-life. The presentations were age appropriate and engaging. The students were very captivated and enlightened. What a beautiful ministry this group has started! 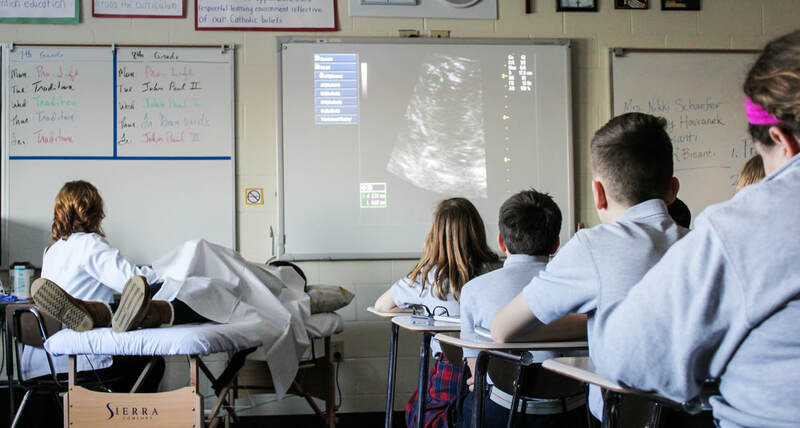 Learning about each stage of development and showing the live ultrasound to the students in all grades is a wonderful idea. The students now all have first hand knowledge that it is a baby in the mother's womb and no one out in the world can tell them different! The presentation was fantastic! The presenters were very knowledgeable and conducted themselves in a most professional manner. 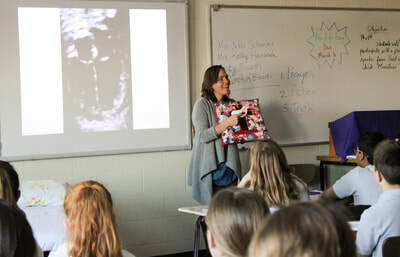 Students were highly engaged with power points, visual aids, video, and especially with the ultra-sound presentation. 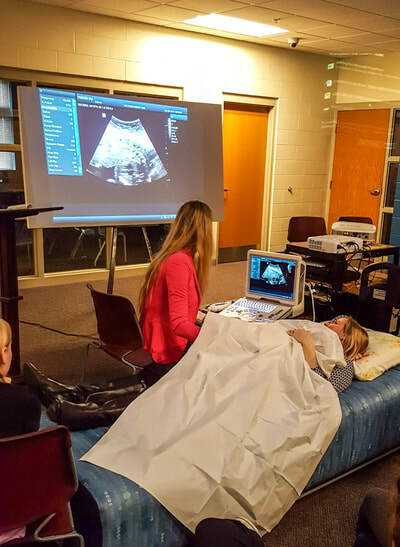 An ultra-sound technician offered additional scientific knowledge throughout the presentation, heightened during the scanning of a live baby in the mothers womb aided by volunteer pregnant mothers. Viewing a live ultra-sound was emotional for students and the experience has made them become more sensitive to the cause of being pro-life. I am thankful to Mrs. Schaefer and the Heart of a Child Ministries for sharing God’s plan of life with our students. Heart of a Child Ministries' pro-life workshop is a beautiful and sensitive presentation of the gift of LIFE. It emphasizes the God given gift of life no matter how small. Nikki’s passion for the life of the unborn is contagious. The students were awe struck with the presentation; the hands on activities and the prayer. As a call to action from this presentation, students are doing a diaper drive for our local Birthright Office. I highly recommend this presentation and the passionate Pro-Life message that it conveys. Our students learned the goodness of the child in the womb when Nikki talked with them about the beauty of life. She involved these pre-teens in making pillows for pro-life, and they fundraised with them the next day donating $500 to their local pro-life organization.